Eggs are central to Easter celebrations throughout the world. They traditionally symbolise life, strength, love and fertility. As Easter itself celebrates new life, no wonder that eggs have become such a potent symbol of it. In Poland, colourful Easter eggs are known as pisanki, a name derived from the word pisać which in contemporary Polish language means exclusively to write, but in old Polish it also meant: to paint. The art of egg decorating originated as a pagan tradition, which was later absorbed by Christianity to become the now traditional Easter pisanki, colourfully decorated eggs symbolising the revival of nature. The oldest pisanki found on Polish territory (egg shells and clay pisanki) come from the 10th century, from the archeological site near Wrocław. There are also mentions in Polish texts from 13th century onwards, claiming that Easter eggs held a reinvigorating power and were known as having healing properties. There are many folk beliefs associated with Easter eggs, some of them still alive and well and some, unfortunately, long forgotten. Pisanki’s shells were, for example, believed to be able to give abundant harvest, if their shells were placed under the pear, apple or plum trees. Many regions in Poland are famous for their intricate patterns, exquisite colours and designs of pisanki. And although nowadays a word pisanki is often used to describe all types of colourful Easter eggs, Polish tradition is much more specific in its nomenclature, and differentiates between Easter eggs made with various techniques. And so, pisanki is the name given to eggs on which patters were drawn (traditionally with melted beeswax), kraszanki is the name of one-colour Easter eggs, and drapanki are Easter eggs on which the pattern was scratched out in dye, with a sharp tool. 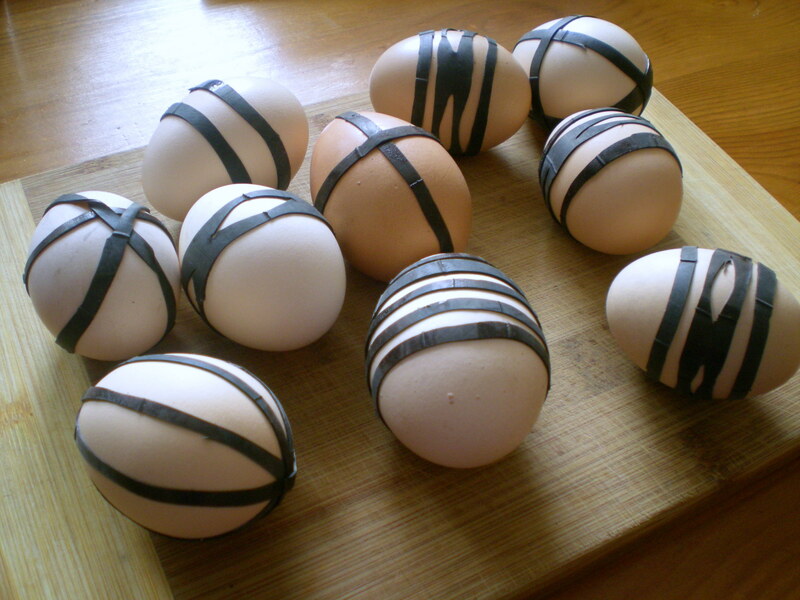 There are more types of Easter eggs in Poland, and many of the traditional patters, designs and techniques are region-specific. Good Friday in many households in Poland is still spent on decorating the eggs: the children gather around the table, armed with a selection of crayons, pens, paints and anything they find useful for egg decorating business and begin to work. Decorated eggs will be the showstoppers of their Easter baskets, which will be taken to the church on the Saturday morning. They must be great! My mum always participated in the egg decorating fun, introducing us to natural, homemade methods of egg dyeing. The most ingenious one, I think, was the idea of using the inner tube from a bicycle wheel, to create incredible patterns on eggs. The eggs wrapped in created this way ‘bands’ would be then boiled together with dried onion skins, which would give them a beautiful, deep brown colour. This year, I have experimented with another natural dye: red cabbage. The result exceeded any expectations I had; red cabbage dye transformed the eggs into vivid blue pieces of art. Żubrek and I spent half a day playing with different plants and a pair of tights, wrapping the eggs in them, dipping into the dye and waiting for the effects. I must say, the world of natural dyes is fascinating and I have a feeling that this year’s experiment won’t be the last! 1. 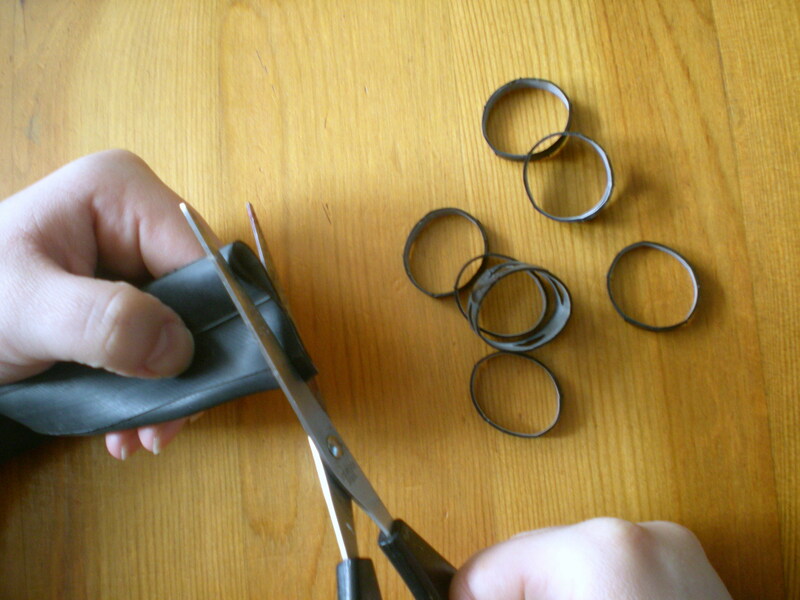 Cut the inner tube in strips. We will use the strips to make patterns on the eggs. You can cut some patterns into the strips. 2. Place the strips over the eggs. The space under the strips will remain white (after colouring). 3. Boil eggs with onion peels in a big pot. Add enough water to cover the eggs. 4. Cook for about about 15 minutes, remove from the pot. 5. Remove the strips from eggs. And we’ve got awesome patterns! 1. Hard-boil the eggs. Bare in mind, the colour will be deeper if you use white or blue-shelled eggs. 2. Once boiled, set aside to cool down and dry. 3. Prepare the dye. Cut the red cabbage into big chunks, add to the pot together with about 1,5 litre of water and 2 tablespoons of spirit vinegar. Cook on low heat, with the lid on, for about 20-25 minutes. Set aside to cool. 4. When the eggs are cold and dry, get creative! Cut the tights into about 10cm strips, tie into a knot at one end. Choose a flower or leaf you wish to get a shape of on the egg, press it against the egg and pull the tights over it, holding the flower/leaf in place. Tie into a knot, making sure the flower/leaf hasn’t moved. Set aside and repeat with all the eggs. 5. Strain the dye, to get rid of cabbage leaves. Pour the ready dye into a bowl, making sure the liquid in the bowl will be high enough to cover the eggs completely. Place the eggs in the bowl with dye, set aside. The longer the eggs stay in the dye, the deeper the colour will be. We kept ours in for about 3 hours. 6. Take the eggs out delicately, and place them on the wire rack to drain off excess dye. Take the tights and flower/leaf off. Bare in mind, that the dye can easily stain the surfaces in your kitchen, make sure to wipe the spillage off immediately (unless you want stained kitchen sides). 7. Let the eggs dry. In contrary to the onion peel dye, the red cabbage dye is more delicate and can easily be smudged if the eggs get wet. Make sure to place them smartly in your Easter basket (not like me, right next to sausage and bacon), otherwise the beautiful blue will change into (still pretty) green. I love that you shared a recipe for dying eggs with natural products! Especially if people plan on eating them afterwards! Thanks! That’s clever to use the bands to break up the colour! I’ve made them using dyes before but not thought of this. Hope you had a good Easter. So cute! Must try this next year. Hope you had a great Easter weekend! I have never seen eggs done that way before! So interesting and cool! A little late for this year, but for next; it’s early! ….and thank you for visiting and liking my Italian Blog too! I love the ones with the onion skins and the rubber bands! cool idea!